A Den of Bears! 2 Pairs, 4 Bears, Great Price! 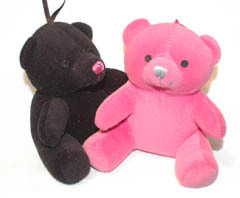 Two Pairs of Little Love Bears - Two Pink and Two Black (four total). It's all about these cute bears sleeping and shipping together that lets us make this deal. These Little Love Bears used to live at Victoria's Secret, and now they can come live with you. They measure 3.5 inches by 3.5 inches and just beg to be squeezed. They sell for $5.00 each, but your can buy two pairs of them (two pink and two black - four total) for $12.00. Do the math. That's $3.00 each.